Last night was Kim and Brian’s wedding- the ceremony and reception were each held at stunning locations: St. Xavier Church and the Hall of Mirrors at Hilton Netherland Plaza. They were such a great, fun couple to work with, and the entire day went beautifully. All of the flowers were done by Timothy’s (513.604.1835). Tim and Kent did an amazing job… as I sat in the lobby with the bouquets and boutonnières, every passerby stopped to stare and ask who had made them. After the ceremony, the guests reconvened (thanks to shuttle service provided by Empire Limo) at the hotel for the reception. The Kevin Fox Band entertained the guests as they dined and danced. The cake was by Maribelle Cakery who always does an amazing job. I also had the pleasure of meeting and working with Larry and Kelly Jensen of Forever Wedding Video – what a sweet couple! Click over to their site to see how the video turned out.. Goodwin Lighting did a great job setting the scene in the Hall with pinspot lighting, color wash on the balcony and a custom monogram. All of the lovely photos are by Steve Lyons Wedding Photography. Kim and Brian are a great couple and are lucky to have such wonderful friends and family! All in all it was a great day and evening. If you are considering the Hilton for your wedding (or any event) contact Robyn Jones – she is great to work with and will definitely take care of you! There are tons of wedding-related books out there- they are full of ideas and insipration, but sometimes they can be a bit costly and do you really need one more expense on your wedding checklist? For my own personal wedding library, I buy all of my books at either Half Price Books or Homegoods. They both have wedding, event and style books regularly in stock in new or almost-new condition, at a much better price! I recently picked up Preston Bailey’s “Fantasy Weddings” for only $15 ; that’s $30 off the cover price. Half Price Books also carries wedding magazines; at 50¢ to $1, it’s a lot easier on your wallet than picking up new copies. Even if it’s an older issue, it might still have the ideas and advice you are looking for. 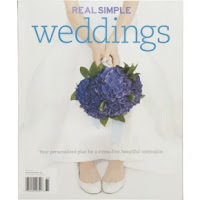 Also, Real Simple (a favorite magazine of mine) has just come out with a wedding planning guide, aptly titled “Real Simple Weddings”. It is filled with good advice and non-overwhelming checklists and timelines. It has a lot less ‘fluff’ than some of the other wedding guides but still has the pictures and inspiration you’re looking for. To top it all off, it’s only $12.95. Finally, if you want to take a peek at these for free, head to your local library or call your wedding coordinator. Both have plenty to share and are happy to do so- just don’t rip out the pages to show your florist! Yesterday was the second Wedding Cafe at The Bridal Studio. Casual wedding chat, mimosas and free cake – what’s not to like! The cafes take place the first Sunday of each month and are of course free. Most of the ladies from The Bridal Studio were there (April of Bluebird Photography, Courtenay of Courtenay Lambert Floral, and Nancy of Brideface. Kristen of Letter Heads was in New York!) along with Jeff from Le Sucre Bakery, Beth from All Occasions, Jason from Iconography and representatives from Arbonne and Mim’s. Mollie of Brideface was there with Nancy and was kind enough to “make me pretty”. The airbrush foundation is too fun. And I very carefully washed my face last night avoiding my faux eyelashes because I want them to stay on forever. That’s probably not healthy but I can’t help it I love them. What can I say, Nancy and her ladies are worth every penny and then some. The next Wedding Cafe will be on March 2nd ~ I unfortunately won’t be there as I will be in California, but if you’re free you should definitely go!